I'm sure that you are all just dying to know who the winner of my blog candy is! I will get to that in a moment but first I wanted to share some more pictures of my little sweetie! I just had to share this hilarious picture that Nick took! She was trying to wake up from her nap and just couldn't seem to keep her eyes open! 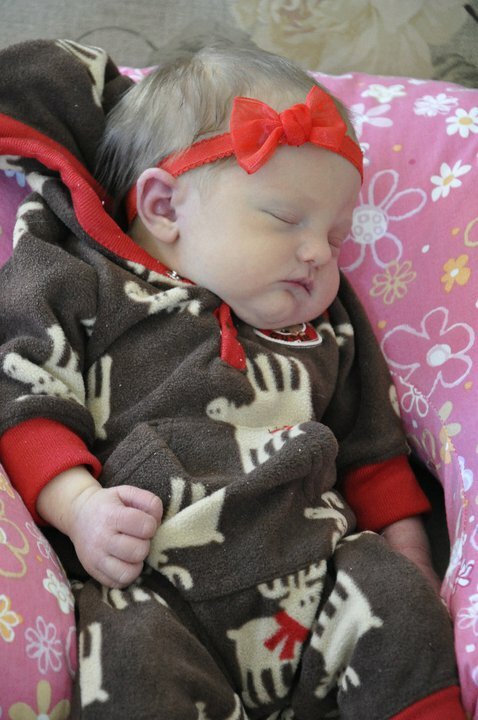 Addison had her first wellness check yesterday and we found out that she weighs more than she did at birth! Woohoo! Let me tell you, this little girl eats like a champ! She sure keeps mommy busy with feedings! Charna said "congratulations! 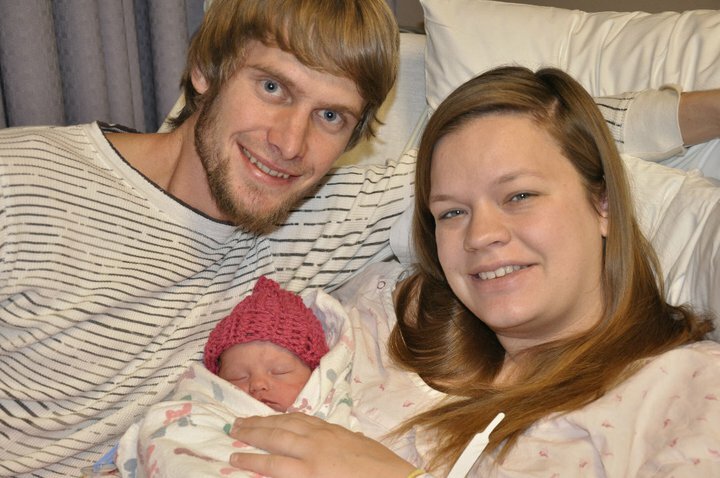 thank you so much for the blog candy and cant wait to see pictures of your little princess!" Charna, be sure to email me your home address so that I can get your goodies mailed out! My email address is stephsstampinstuff (at) gmail (dot) com. So one of the ways I have kept myself motivated this past month is by setting up an inspiration station for myself. As most of you know, it is sometimes (ok, ok, VERY) difficult for me to find my stamping mojo and this has REALLY helped! I have always been a huge fan of Michelle Wooderson from Mish Mash and she is the original brains behind this inspiration station idea! Basically my inspiration station included items related to the upcoming holiday (this one being Valentine's Day) as well as any new items I've received or any old items I felt the need to break back out! My inspiration station table is also my cutting table so that is why you see my Cricut and Big Shot there as well. Behind the table are two large windows where I have also decided to display my creations using the materials from the table. If you would like to see a close up of what I have, make sure to click on the picture! Thanks so much for allowing me to share this with you! Once Valentine's day has past, I will be updating my station with new goodies! 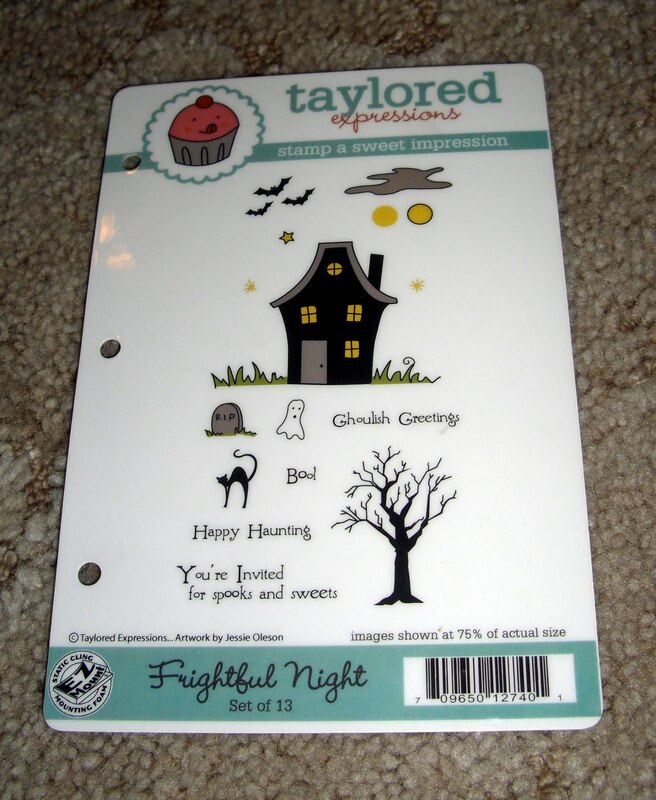 Welcome to Taylored Expresions' Blast From the Past Blog Hop! This month's blog hop theme is LOVE so of course I had to pull out my very favorite TE set called "Love is Sweet"! This set has some of the cutest images in it and I am very partial to this kissing cuppie image! Isn't is SO cute? :) I stamped them and colored them with my Copics. I then cut them out and popped them up on some old book paper that I had lying around! The sketch I used is the Viva La Verve sketch challenge #2 and I paired it with some more BasicGrey Bittersweet dp! I used my swirls CB embossing folder to emboss the panel behind the main image and then tied some fancy ribbon on! As a final touch I sponged all of the edges with some Tim Holtz Antique Linen distress ink and then added some pretty pearls to the corner of the card! 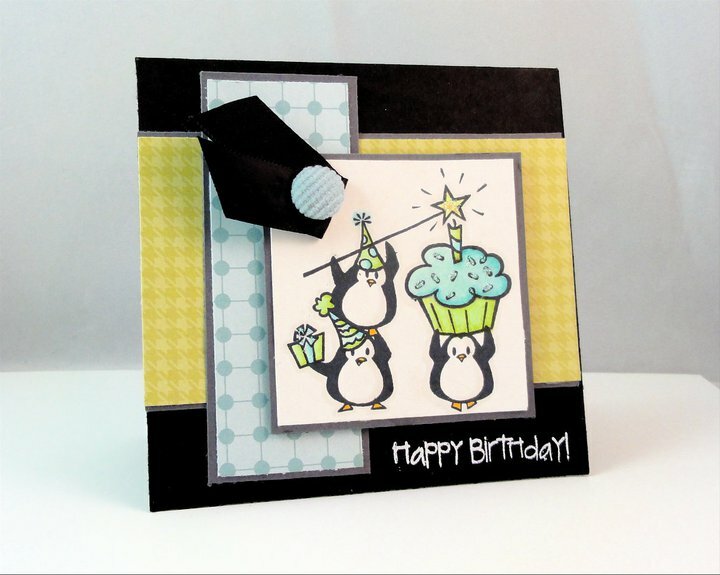 So now that you've seen my card, make sure you check out everyone else who is participating in today's fun blog hop! Also, if you haven't already, please stop by the Taylored Expressions blog to see all of the details! I'm still in the hospital after having my c-section so this is being posted in advance! Don't forget to enter my blog candy drawing down below while I'm away! For today's card I decided to pull out another adorable Kraftin' Kimmie Stamps image called "Lillith"! 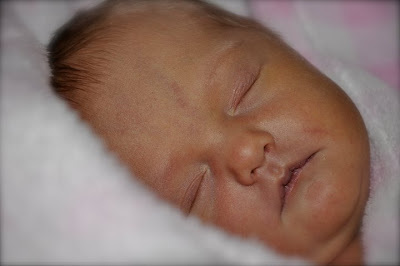 I fell in love with her the minute I saw her! She just looks so ornery, doesn't she! :) Anyway, as I was sitting at my desk trying to think of a sentiment to go with her I realized that she reminded me very much of The Frog Prince! Why else would she have a frog sitting on her head??? Haha! I then found the sentiment "Kiss Me" from Kim Hughes' set called the Birds and the Bees and decided to use it! I colored her with Copics and decided to color and cut out the cute little froggie stamp that comes with her so that it would look like the frog was saying it! What a perfect Valentine from a guy to his gal! I think it's so cute! As for the rest of this card, the sketch is from last weeks Viva La Verve sketch challenge #3 and of course I had to enter it into the Kraftin' Kimmie Stamps challenge which was to include flowers on the card! The paper is from Cosmo Cricket and that is where I pulled my colors from. I am currently in the hospital giving birth to my daughter Addison and I decided that I should celebrate by offering you some blog candy! :D I will be sure to post pictures of her as soon as I can but until then, take the time to leave a comment and be entered into a random drawing for some goodies! So what's up for grabs? How about 30 different sheets of double sided designer paper, some amazing twine, a set of Inque Boutique stamps, some fun Heidi Swap cards, scrapbooking stickers, and 5 paper punches? Sounds pretty good huh? Leave me a comment by January 24th and I'll draw a name to see who wins! Good luck! I'm Nuts About You Valentine! Isn't he CUTE??? I just love this stamp set called "You're So Punny" by There She Goes! I wanted to create a fun Valentine's Day card for my husband and knew this little squirrel would be perfect! However, Nick saw the card and said "Did you make this for me??" Haha! Of course he was excited about it but obviously he knows me way too well! Anyway, I colored the squirrel with my copics and did quite a bit of sponging on this card. I used Karen's Sweet Sunday Sketch from last week and combined it with more of my BasicGrey Bittersweet dp. Also, stay tuned for some BLOG CANDY! It's time for me to purge my craft room and try to make some extra cash. I absolutely HATE to part with these stamps but since my husband is out of work for the winter and we have a baby on the way, we desperately need to make some money. Most of these stamps have been used but I do have some that have never been used! There are a few that have staining on the wood block or the rubber but it will not affect their performance one bit! :D I have marked the condition of them. All sets are sold as is and may not be returned. Below is the list of stamp sets I have for sale. If you have any questions, feel free to email me! All sets in bold black are still available but as they are spoken for, they will be changed to bold gray. If for some reason a sale falls through, I will change the set back to black! Shipping details are listed on the bottom of this post so make sure you read that. ~US transactions only - that means you must pay in US Dollars and I will only ship to US addresses. ~I will accept PayPal or checks but I will have to wait for the check to clear if that is an option you choose. 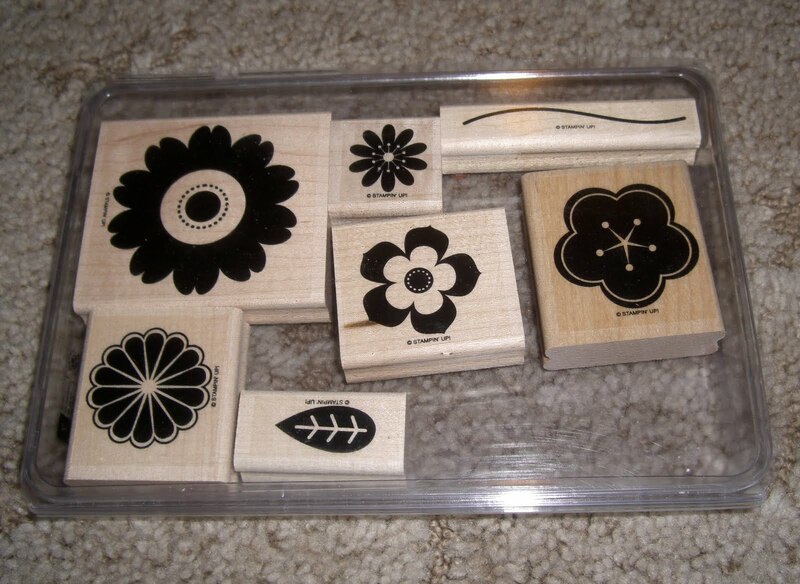 ~Shipping charge is a flat rate of $5.00 for the first stamp set and an extra $2.50 for each additional set. ~I will only ship Priority which means you should receive your package in approximately 2-3 days. ~All sales are final - no returns. If you would like to buy any of these stamp sets, please send me an email (stephsstampinstuff@gmail.com) including your name and shipping address. I will reply with your payment total and my PayPal address. As soon as I've received your payment, I'll ship the stamp sets to you! Good morning! I am so excited about this morning's post! 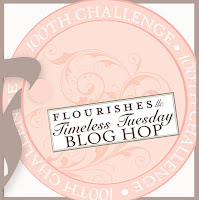 The Flourishes team has asked it's customers to join them today in their Timeless Tuesday's 100th Challenge Celebration Blog Hop! Well since most of know that Flourishes is one of my all time favorite stamp companies, of course I had to join! :) What perfect timing too because my order from them came in the mail this week! I had been eyeing this set called "Cherry Blossoms" for quite a while now and finally decided to get it! Yay! I absolutely LOVE cherry blossoms in the spring so I knew this set was a must for me! Anyway, the challenge for this week's Timeless Tuesday was all about your favorites! Well I would say I included a lot of favorites on this card. First of all, this cherry blossom stamp is one of my new favorites and cherry blossoms are one of my favorite flowers! :) Pink is also a favorite color and I just love using glitter (which this card has lots of, it's just hard to see in the picture). I colored the flowers with my Copic markers and added some fun dew drops in the corners of the image panel. For a little bit of extra flair I also used my Martha Stewart lace punch to add a fun little scallop. As much as I love this card, I am honestly really disappointed in this picture. It definitely does not do the card justice. We got a new camera and I just haven't been able to figure out how to use it yet. I also had a bulb burn out in my photo tent light and the bulb I replaced it yet puts off a yellow glow. :( I am going to try and take a picture of the card in the sunlight and see if that helps with the colors. I really want you to be able to see how beautiful the coloring turned out! Well, that's it for my post! Make sure you stop by the Flourishes blog so you can see who else is participating in today's blog hop! I can't wait to see what the other ladies have come up with! :) Thanks for taking the time to check out my card! Enjoy your weekend! Well I was originally planning on sharing another Valentine's Day card with you but then I decided to get crafty today and came up with this card instead! :) I have had this stamp from Kraftin' Kimmie Stamps for over a year and it has never seen ink! GASP! I know, I know, I'm a bad stamper. Anyway, I bought it just after Kimmie had her very first release and then I ended up taking a stamping hiatus. I knew when I saw her I had to get her though. I find her absolutely adorable but for some reason she creeps my husband out a little! Haha! It's a good thing he doesn't get a say! ;) Her name is Charlotte and I must say that she was so much fun to color! I paired her with some of my older Paper Studio dp from the Serendipity line. She was then colored with my Copics (which I'm still attempting to learn how to use). Since I was using her I decided to go ahead and participate in this past week's Kraftin' Kimmie Stamps challenge which called for no ribbon or fibers! YIKES! 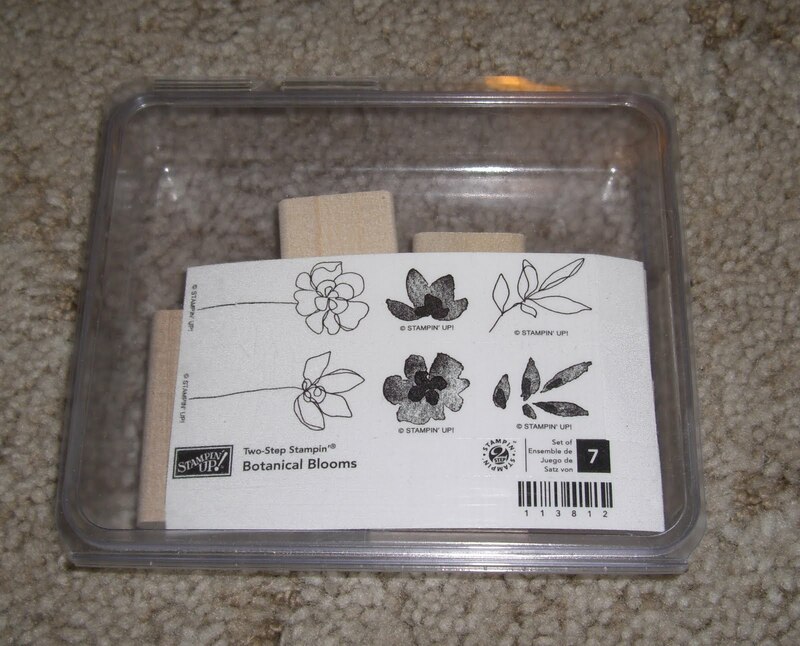 I hope my flowers don't count as fibers but I thought they looked so cute with the image! Since I find her to be so cute, I am also entering this card into today's Paper Play challenge which is called "Cutie Patootie". The sketch started out as this week's SCS sketch challenge but I quickly discovered that my image didn't fit so I had to flip it instead. I really like the layout still though! As a final touch, I embossed some buttons across the bottom and distressed the edges with some Tim Holtz Antique Linen distress ink. Good evening everyone! Sorry I'm a little late with my posting today but I wanted to finish reorganizing my craft room and I think I can officially say it's finished! :) I have a few projects I want to work on but they are nothing big. I'll be sure to show you pictures of it later on! Well I think that's it for today's card! Stay tuned for tomorrow's card and don't forget that I have some fun blog candy coming up! Thanks so much for stopping in! Enjoy the rest of your Wednesday! Are you ready for another Valentine's Day card? I'm telling you, it's an addiction! :) I honestly wish I had more Valentine's designer paper but I don't so you will just have to bear with me! So for this card I decided to pile on the challenges! I was able to combine so many of them! First of all, the images are from Clear Dollar Stamps in the set called "Love Tweet Love". This is a really fun digital image set with 3 images and 4 sentiments! The best part, it only cost me $3! What a deal! :) Anyway, I decided to use it for the Clearly iStamp challenge called "Love is Sweet". I also pulled the colors from the inspiration challenge over on Crazy 4 Challenges and since I was using these cute birds I decided to enter it in the Our Creative Corner inspiration challenge as well! The sketch is from The Sweet Stop challenge and I also decided to enter this card into the BasicGrey challenge which was to use dots or spots. Finally, I saw that this past week's JUGS challenge was to decorate and line a matching envelope so I went ahead and did that as well! :) PHEW! Talk about a challenge! It wasn't easy trying to include every challenge but I managed to do it! The designer paper is from BasicGrey's Bittersweet line and the buttons are some I just happened to have in my stash! I have been in a "distressed mood" lately (hehe) so I sponged and roughed up the edges and added a little bit of sewing as my final touch! Welcome to another Monday! 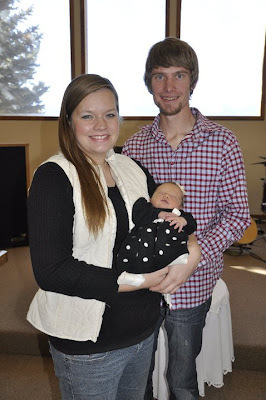 In exactly a week, I will be holding my baby girl in my arms! That is so crazy to think about! :) Anyway, I wanted to share this fun card that I made this past week. Isn't this image from The Cat's Pajamas great??? I just love this set called "Smells Like Cake". I wanted to participate in the TCP Tuesday inspiration challenge as well as Jen del Muro's Sketch For You To Try so I pulled this little cutie out! I decided to keep it gender neutral since I seem to always be short on masculine cards. I think I did an ok job on it! As for the card details, the image was colored with my copics and the sentiment was stamped in versamark and then heat embossed with white embossing powder. I added some stickles to the cupcake and party hats for a little added dimension. I then used some retired SU! paper and added a corduroy button with a little ribbon embellishment to finish up the look! I hope you all have a fantastic Monday! I have absolutely LOVED being able to post a card daily this weekend and I hope to keep them coming! 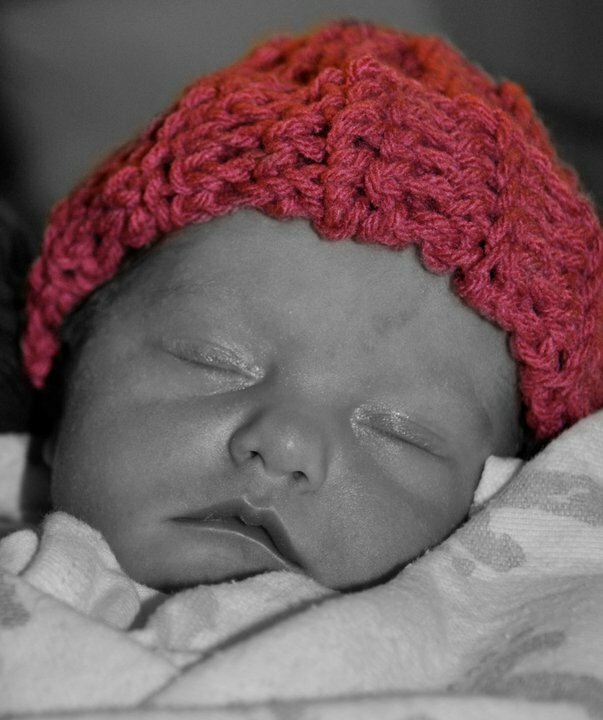 I am going to try and get a bunch made so that I can have some ready to post when I'm recovering from my c-section! I don't want to fall out of the habit of posting again! So I must warn you. Since Christmas is over, I've been on a HUGE Valentine's kick. I just can't stop making Valentine's Day cards! They are so much fun to make. Maybe it's the colors, I'm not sure but either way, I have lots of them to show you! For today's card, I used this past week's Mojo Monday sketch challenge. The sketch was a lot of fun to work with and I knew these cute birds from the Birds and the Bees set by Kim Hughes would be perfect! By the way, this just happens to be my favorite Valentine's set so you may see quite a few cards using it! :) Anyway, I also decided to use the color challenge from Flourishes on it and I ended up throwing in a little brown as well. Hope that's ok! The papers used for this card are retired papers from SU! I sponged the edges with Tim Holtz distress ink and then sewed around the outside and on the little pink strip. The images were colored with my Prismacolor pencils and I added a little twine so that I could qualify for the SCS Ways to Use it Challenge. Well I hope you enjoyed today's card! 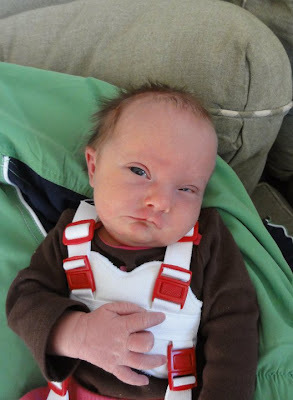 Not much to update you on as far as this baby is concerned. I've had quite a few contractions but they haven't led anywhere yet. As for other news, we are getting snow today! I am absolutely LOVING it! When I sit at my stamping desk I am directly facing the windows and it has been just gorgeous today! Thanks so much for stopping by! Be sure to take a peek at tomorrow's card (which surprisingly isn't for Valentine's Day). Until then, have a great Sunday evening! Doesn't a peach just sound amazing right now? Ok, so maybe that is my pregnant belly talking but seriously, I could go for some yummy peaches right now! Peaches in January are a little hard to come by so I decided to share this pretty card with you instead! It reminds me so much of summer and even though I'm not ready for summer yet, I'm sure some of you are! Here in Colorado we have had hardly any snow at all. Surprising, huh? However, back in Iowa where I grew up, they are SICK of it! So about this card. I used one of my absolute favorite Flourishes set called Peaches and Cherries. I paired it with some super old dp that I had stashed away. In fact, I think this dp was the very first set that I had ever purchased when I started stamping! Crazy! :) I also used some fun plaid ribbon and pretty pink pearls to embellish this card. The peaches were colored with my Copics and I added the sentiment as a tag!